The new bee hotel at the New Hampshire Agricultural Experiment at UNH’s Woodman Farm is part of a new research project that will assess for the first time the diversity of New Hampshire’s bee population. The phrase “bee hotel” conjures up cutesy images of bee bellhops buzzing around a honey-filled lobby and a pampered queen lounging in a luxury suite. 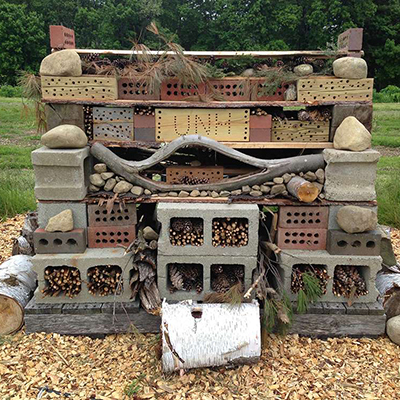 The cute moniker notwithstanding, there’s nothing trivial about the new bee hotel at the University of New Hampshire. Sandra Rehan, assistant professor in the Department of Biological Sciences at UNH, admits that the name has succeeded in getting attention, which is exactly what she hoped for when she constructed a bee hotel in June at UNH’s Woodman Horticultural Research Farm in Durham. Rehan, who heads up UNH’s Bee Lab, is using the bee hotel to attract and study New Hampshire’s estimated 250 species of native bees. Although the plight of honeybees is well-documented and largely on the general public’s radar, many people don’t realize that honeybees aren’t native to the United States. They were brought to the New World by European settlers in the 1600s. And many people also don’t realize that honeybees aren’t the only bees out there. In fact, there are almost 20,000 different bee species on earth, and 4,000 of them are native to the United States, according to the U.S. Geological Survey. To attract and study those roughly 250 other guys, as well as provide a crucial habitat for them, Rehan constructed UNH’s bee hotel out of objects native bees like to live in and build their nests. The six-foot structure stands on a 4-by-4-foot wooden pallet and is stacked high with found materials like wooden “bee blocks” with quarter-inch holes drilled in them, bricks and cinderblocks, wooden logs, and dead and broken stems and sticks. Native bees, such as mason bees, trap-nesting bees and carpenter bees, can build their nests in all of the little crevices and cavities that are provided throughout the bee hotel, including inside stems. From there, Rehan and her team of students can collect and study the different bee species. After studying bees in places as far-flung as Panama and Australia, Rehan came to UNH to study bee behavior. But when she arrived there last year, she discovered that the state was lacking even a basic catalog of its native bee species. She realized that in addition to studying bee behavior, she could also gather some basic bee biological data to establish which species call the Granite State home. Rehan says it’s the first research of its kind in New Hampshire. Why the emphasis on native bees? For one thing, it’s important to protect biodiversity, and native bees are under threat in much the same ways as honeybees are. Their populations are in decline all over the world — some species have even gone extinct — and “scientists are trying to figure out the cause,” says Rehan. From an economic perspective, it’s important to protect native bees because they’re pollinators, and provide a crucial, $20 billion-a-year service to the U.S. economy. Although honeybees might be the best-known pollinators, native bees are often better at it, Rehan says, especially for native crops, like blueberries and cranberries, as well as native plants that populate our green spaces. In addition to using the bee hotel to attract and study bees, Rehan hope to raise awareness of native bee populations among the general public. Although the bee hotel at UNH is large and located on a farm, Rehan says anyone could build one of any size in their own backyard. Rehan also says farmers, homeowners and even municipalities can help increase native bee populations by doing things such as planting diverse crops, leaving grassy areas of land un-mowed and allowing wildflowers to grow in median strips on roadways. “We know that mowing and monoculture affect their health and diet and their ability to utilize pollen,” Rehan says of native bees. The New Hampshire Department of Transportation has been helping bee habitats unintentionally, says NH DOT public information officer Bill Boynton. The state has also had an active wildflower planting program since the 1960s. As a result, the department has gotten thanks regarding the bees, although Boynton says helping bees is just a happy accident. “We did get a letter late last year from the New Hampshire Beekeepers Association thanking us for our efforts,” he says. And although budget cuts and other, more pressing needs sometimes cause mowing to fall to the bottom of the priority list, Boynton says mowing is necessary. “Roadsides and medians are mowed primarily for motorist safety (i.e. line of sight, small animals, etc.) and to keep forests from encroaching along the roadsides,” he wrote in a separate email. Although Rehan acknowledges that most people want to get rid of bees in their backyards, she hopes that her bee research and the new bee hotel will teach people not only about the importance of bees, but also correct their misconceptions. For instance, most bees don’t make honey, and they don’t usually swarm. They’re not typically aggressive, like the yellow jackets and other wasps they’re often confused with, and they’re not even always black and yellow. Some are bright, metallic green or black. And their co-evolution with native plants means millennia-long relationships between the two are in danger as bee populations suffer.